With this setting, the user account that is used for logging in to the NT or ADS domain will also be used to log in to the portal. All users must be able to log in to their corresponding domains, or a position of trust must exist in regard to the domain of the Intrexx portal server. This option is required when users with browsers such as Netscape Navigator or Mozilla Firefox access the portal. These browsers support no encrypted login (integrated Windows authentication). The password will be transmitted in plain text in this case. Please note that the password may be intercepted with this unencrypted transmission method. If this option is activated, passwords will be transmitted unencrypted to the webserver. This option allows users with Microsoft Internet Explorer to login without entering a password. The users will be authenticated when they log on to Windows. Enter the Windows domain you would like to log in to here. Enter the Windows domain controller for the domain of your choice. Enter the server that is responsible for WINS name resolution. Specify the server and the port that should be used for the authentication in the Intrexx portal. 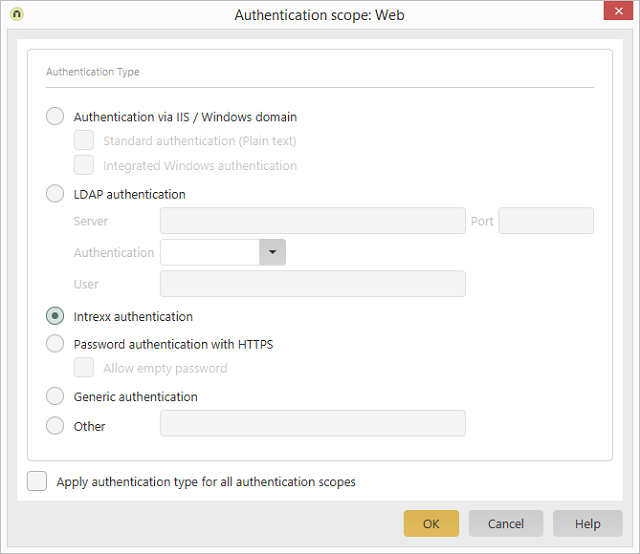 Select the authentication method of your LDAP server. The Simple setting is the typical setting. Click here for more information about LDAP authentication. Regardless of membership in local domains, each user will log in to the portal with the user name and the password from the User Manager. Select the user who will assume the role of anonymous user from the Anonymous user drop-down list. The anonymous user is the user who accesses the portal without logging on. This account will be used for all users before logging on. The type of authentication can be changed at a later point in time from Intrexx Authentication to Authentication via Web Server. The change will only take effect once the users are imported. The authentication is performed with HTTPS. Allows authentication when the password field is left blank. Generic authentication allows the configuration of an authentication module for authentication via an LDAP server. In this case, the user name and the password will be transmitted in plain text. Please make sure that the login only is transferred via secure connections. To set up the generic authentication, please contact United Planet Consulting. Other authentication modules can be developed based on your needs. As examples, the authentication can be instituted here via X509 certificates, authentication to systems from third party providers, and so on. If you have questions, please contact United Planet Consulting. The settings made here are applied to all other authentication scopes.